On Friday, January 11th, 2019 the first WheatCAP Plant Science Symposium was held on the San Diego State University Campus. As part of the Corteva Plant Sciences Symposia Series, the event included talks from four notable keynote speakers, a panel discussion and six student research talks. The title of the symposium was Bridging the Gap: Using Functional Genomics to Unlock Yield Potential. The aim of the symposium was to further explore the current and future application of functional genomics techniques in addressing the challenges of yield gaps as well as, yield improvement in cropping systems. Furthermore, this event aimed to provide the next generation of plant scientists, geneticists and breeders the tools to address the existing and emerging challenges related to global food security and production. We had the privilege of hearing from Corteva spokesperson Dr. Jason Rauscher, Dr. Gina Zastrow-Hayes the Genomics technology leader at Corteva Agriscience, Dr. Ronan O’Malley leader of the Sequencing Technologies Group at the Joint Genome Institute, Dr. Scott Boden a Royal Society research fellow at John Innes Centre and Dr. Scott Jackson professor and director of the Center of Applied Genetic Technologies at the University of Georgia. Ultimately, the goal of this symposium was to bring together graduate students to encourage networking and the sharing of science. I truly believe these goals were met and at the completion of the event I could not help but feel inspired and motivated to continue in my own attempts to better understand and illuminate the black box of crop yield. Front Row (left to right): Burcu Alptekin (student speaker – MSU), Gazala Ameen (student speaker – NDSU), Dr. Scott Haley (panelist CSU), Chia Cheng Kan (committee – OSU), Dr. Jason Cook (committee advisor – MSU), Jeff Neyhart (student speaker –UMN), Brittney Brewer-Jones (committee co-chair – MSU), Dr. Gina Zastrow-Hayes (keynote speaker – Corteva), Saarah Kuzay (committee – UCDavis), and Max Fraser (committee co-chair, UMN). 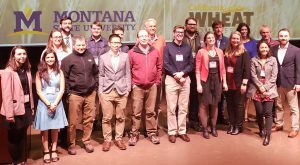 Back Row (left to right): Priscilla Glenn (committee – UCDavis), Andrew Katz (committee – CSU), Dylan Larkin (committee – U of A) Dr. Scott Boden (keynote speaker – John Innes Centre), Dr. Jorge Dubcovsky (WheatCAP Co-PI), Ian McNish (student speaker – UMN), Dr. Ronan O’Malley (keynote speaker – JGI), Laura de Boer (student speaker – UC San Diego), and Dr. Scott Jackson (keynote speaker – UGA). For more details about the speakers, please follow this link. The abstracts of the students’ presentations are available here.